For me the end of May and the start of June just doesn’t get much better. This year the challenge is where to fish. Even rivers that are normally out of sorts this time of year, like the South Fork of the Snake, have been fishing very well. Good reports have also come down from the Madison River, 40 miles to our north. Some of our shop guys have brought back great reports from the Firehole in Yellowstone Park. Closer to home, the Henry’s Fork below my house upstream from St. Anthony has produced great fishing as some of our guided customers can attest. The Salmonfly hatch has moved up through the canyons below Riverside Campground and is now in full swing in the Box Canyon. This water is much lower than normal and your best option is to wade. Floating requires drifting through the best holding water. I’ve had my best luck with Salmonflies by waiting until late afternoon or evening when most of the traffic has dwindled. I’m blessed to have some personal fishing experiences to share in this report. It all started on Memorial Day weekend when John Mauldin (Hootie) took my wife Sheralee and I down below Lower Mesa Falls to float Cardiac Canyon in one of our new Aire rafts. At our age we were thankful we could still handle the steep 1500 foot trail following Hootie as he dragged the raft down to the water. Choosing Memorial Day weekend wasn’t the wisest choice as there were more boats than I’ve ever seen but it was the only day Hootie had open. We stayed with dry Salmonfly patterns all day and the action started as soon as we got underway. We both were a little slow on the draw as trout smacked our Foam Henry’s Fork Salmonfly and Chubby Chernobyl patterns in the fast water. I pulled the fly away from two big browns that took the fly downstream as it drifted along the rock shelves. Sheralee hooked a monster near a partially sunken log that shot past the raft and raced upstream into another log jam. It was fun while it lasted but that fish was in complete control until the 3X tippet snapped. In the end we both caught lots of nice rainbows along with a few browns. In fact I landed a nice brown right at the Stone Bridge boat takeout. Although the Salmonflies have moved on there are still Golden Stones hatching making this spectacular float a great option over the next several weeks. About a week ago I floated with my son Chris and Devan Ence from St. Anthony downstream to the Parker/Salem Bridge. 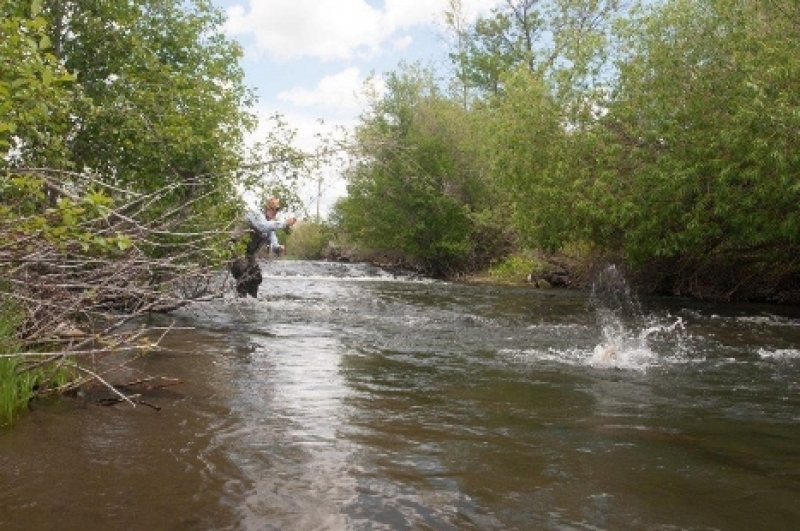 While this stretch doesn’t get a strong Salmonfly hatch, the emergence of the big stoneflies is spread over a longer time frame so the trout look for them over a period of weeks rather than days. Their smaller Golden Stone cousins are also widespread in this section of the Henry’s Fork. 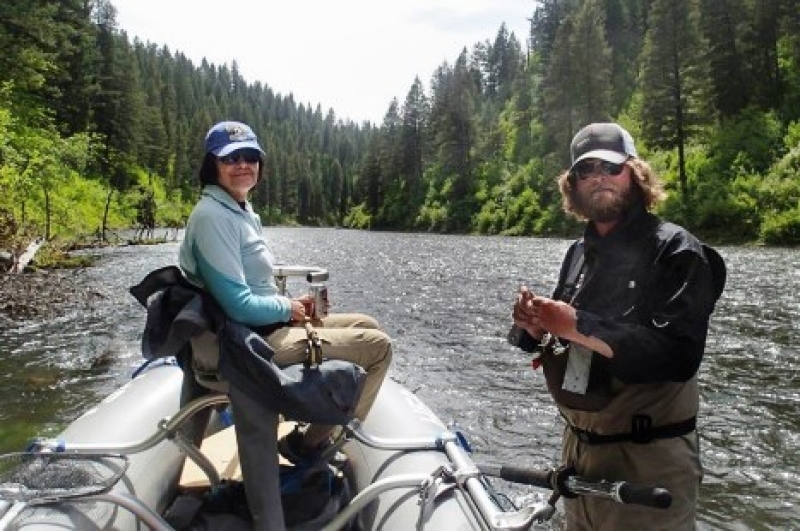 While we caught lots of browns and rainbows as we drifted from the boat we also caught good numbers of fish wading the many side channels common on this great stretch of Henry’s Fork. 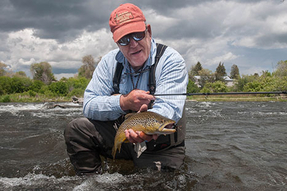 Later in the week Tom Grimes and I took a short float on the Lower Teton River. We couldn’t get to the private water we hoped to fish due to muddy roads so we floated a short section near St. Anthony. 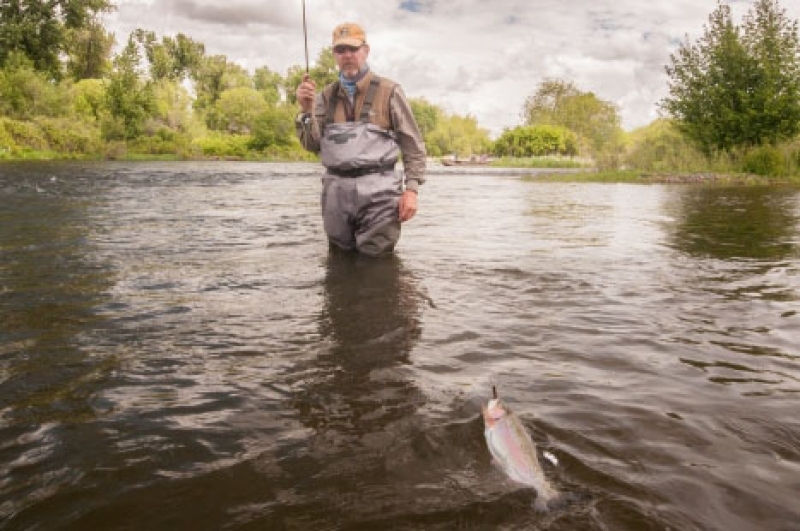 The water was high and discolored and we didn’t expect to catch anything but we managed to entice a couple of large Cutthroats to our streamers. I love this water that I’ve fished since I was a kid and it should be in good shape in another week or so. It was also a treat to spend a day on the water with Bob Lamm. Bob and I worked as guides for the same outfitter in West Yellowstone back in the 1970s before we opened Henry’s Fork Anglers. We hadn’t fished together for several years due to the fact that he is always booked or my busy schedule won’t fit with his. Over the 36+ years he has guided for us he has been honored with a national guide of the year award, served as a mentor to dozens of other great guides, shared his expertise and knowledge with hundreds of customers, and most importantly he has remained one of my closest friends. We caught some nice fish but more important was the utter enjoyment I had spending a day with a man who has worked and earned his spot as one of the best in the business. 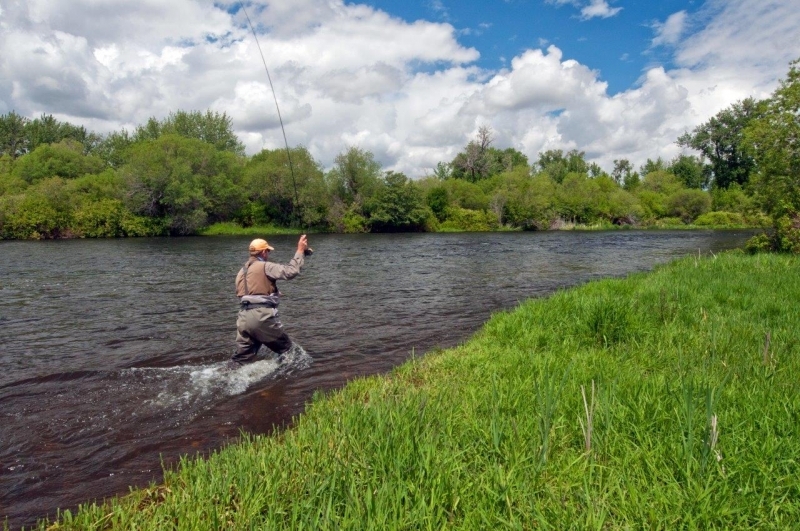 There are lots of other places I’d fish if I were totally retired and didn’t have my duties to fulfill at Henry’s Fork Anglers. I’d spend more time fishing across the street at Last Chance. I have a couple of friends who have been enjoying great early season dry fly fishing. There have been good hatches during cloudy weather. There are caddis, March Browns and Blue Winged Olive mayflies. It’s also time to start looking for Pale Morning Duns. Henry’s Lake Outlet is another good option. There are nice fish that moved down from the lake earlier this season. The upper section below the dam can get very crowded. My choice would be to park at the Nature Conservancy headquarters at the Flat Ranch and hike across the meadows. There are some nice pools downstream that hold fish. I would also like to check out the Firehole. This beautiful small meandering river doesn’t’ hold big trout but it is a fine place to use my Sage TXL 3-weight fly rod. I also love to spend time in the park before the brunt of the tourist season is upon us. Lastly, if I can find a day when our guides aren’t going there, I’ll walk 300 yards down from my house and fish the home water. Sadly I haven’t fished there in over a month. There should be some Pale Morning Duns coming off.